Las Vegas, (October 16, 2017) – Grupo Vidanta, Mexico’s leading resort operator and tourism developer, and Hakkasan Group, one of the world’s leading hospitality companies, have revealed a first look at the new entertainment and lifestyle offerings at Vidanta Los Cabos. Destined to become the entertainment hub of Los Cabos, visitors can expect a sophisticated beachfront atmosphere with distinct daytime and nighttime elements that blend seamlessly from sun up to sun down. The fully integrated experience will debut four new venues opening at Vidanta Los Cabos. Launching in early 2018, OMNIA Dayclub, Herringbone, SHOREbar and a new restaurant concept, Casa Calavera, form the core of this exciting, new experience at Vidanta Los Cabos, establishing a new level of resort hospitality and entertainment in San Jose del Cabo. They mark the first openings in Mexico for Hakkasan Group and are the first venues to launch as part of a $150 million partnership between the two companies that aims to raise the entertainment bar to new heights in Mexico. The flagship OMNIA Nightclub opened in Las Vegas in 2015 and quickly established a reputation as one of the world’s greatest nightclubs with a diverse musical roster that features some of today’s most in-demand DJs. 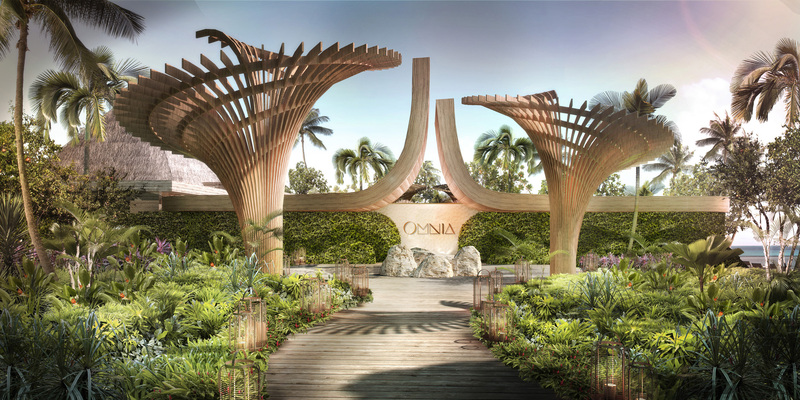 Los Cabos will be one of the first markets in which OMNIA is opening as a dayclub concept. The beachfront dayclub is arranged around a central pool with an array of VIP areas including private cabanas and a pair of two-story VIP bungalows with private infinity plunge pools. With a talent line-up of world-class DJs, OMNIA Dayclub will set a new standard of service and entertainment within Los Cabos and beyond. Herringbone, a restaurant brand conceptualized by Chef Brian Malarkey, originated in La Jolla, California and offers coastal cuisine with an emphasis on line-caught seafood and high-quality meats. For Vidanta Los Cabos, which is the first international opening for the brand, Herringbone has been reimagined as an airy Mexican beach house with views over the resort’s pools to the ocean. The restaurant features some of Herringbone’s signature design elements such as living trees, lush vegetation and maritime artwork and fixtures. Casa Calavera is a new culinary concept developed by Hakkasan Group which reflects its Los Cabos location with an open-air, “feet in the sand” feel and interiors that feature traditional Mexican calavera art and an authentic Dia de los Muertos theme at its core. Adjoining OMNIA Dayclub, Casa Calavera will share the ambiance, sounds and energy of the dayclub while offering a menu of popular Mexican dishes and drinks. Authentic Mexican furniture pieces and lighting nod to the local culture with an array of architectural finishes, from hand-painted tiles to pebbles and stacked stone. Entry to the restaurant is via a long corridor with special reveals that create a dramatic sense of arrival and set the tone for this fun, relaxed and stylish venue. Sitting under a striking, curved thatch roof and overlooking one of the resort’s main pools, SHOREbar is a casual, open-air pavilion offering hand-crafted cocktails with pool and ocean views. Clusters of pendant lights hang over wood lounges and tables, with subtle industrial details and blue-hued rugs and upholstery. A vintage van parked within the venue will offer a small menu of light bites and dishes to share. Vidanta Los Cabos is situated in San José del Cabo, Mexico which is a destination renowned for enjoying over 350 days of sunshine annually. Located about 20 minutes from the airport in San Jose del Cabo, the resort is easily reached from several major gateway cities in Mexico and the U.S. As a vacation destination, it offers an extraordinary wealth of enjoyable activities, fun excursions and memorable experiences. With the addition of these new venues at Vidanta Los Cabos, world-class entertainment can now be added to this list. Grupo Vidanta’s real estate division has built and sold more than 2,000 luxury vacation homes and is responsible for developing Mexico’s first privately built and owned airport, Mar de Cortés International Airport, in Puerto Peñasco. Frequently named among the “Best Companies to Work for in Mexico” and currently ranked as 4th place in the Great Place to Work® list for 2017, the organization maintains a strong commitment to its 15,000 employees, and surrounding communities, through its progressive mission dedicated to environmental and social efforts, including EarthCheck certifications and its long-established non-profit foundations, the Vidanta Foundation and the Delia Morán Vidanta Foundation. For more information, visit www.GrupoVidanta.com/.